Since the first article in this series, Modifying an FJ Cruiser for Overlanding, Toyota has announced that they’ll be discontinuing the FJ after 2014. According to Jalopnik, Toyota has sold more than 200,000 of them since debuting in 2006 and needless to say there’s enough of them out there if you still want to find one. 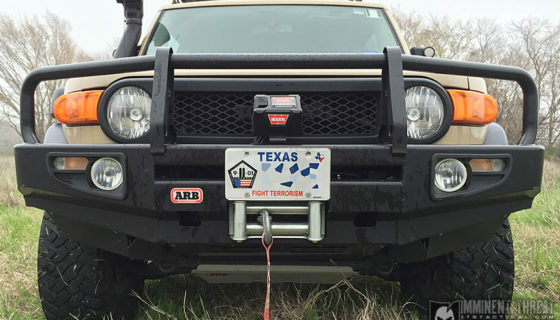 The large user base has also given companies the justification to create aftermarket parts for the FJ and there’s quite a few options out there. 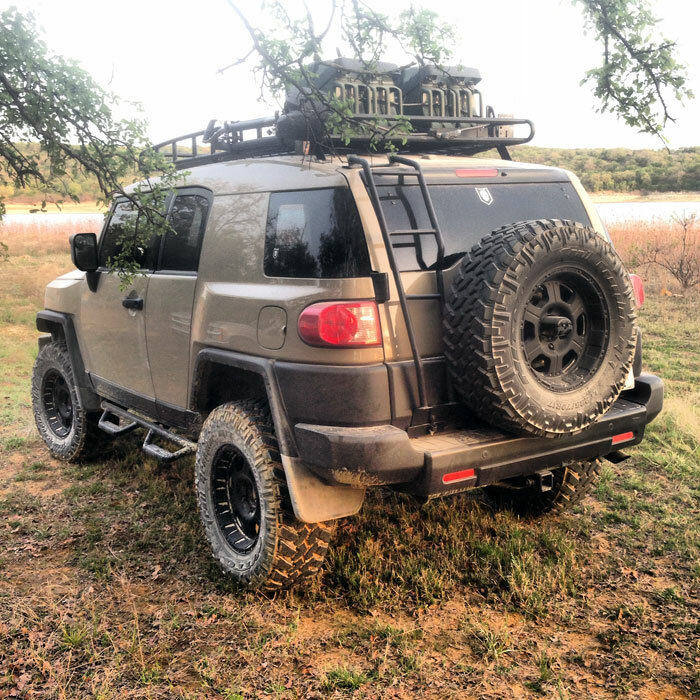 I’m still loving my FJ and continue to modify it frequently, in fact it just came back from stretching its legs a few months back at the 2014 Overland Expo. 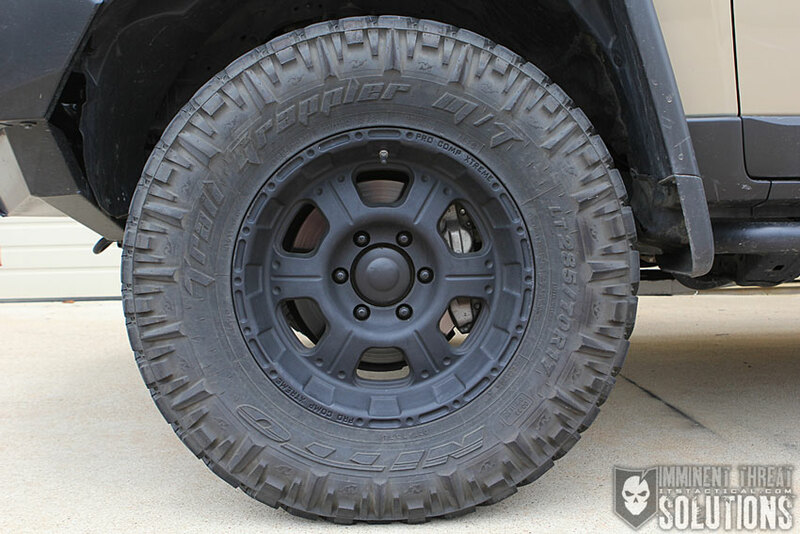 Today’s article will focus on security and the things I’ve done to my FJ to not necessarily make it bulletproof, but to increase what every security measure accomplishes; buying time. Take household security for instance, your alarm system (complete with yard sign and window stickers) is a deterrent in itself. You hope that it makes would-be thieves look elsewhere, but it’s truly only going to slow down a determined thief, i.e., buying time. I’ve talked a lot about the security here on ITS and take it pretty seriously when it comes to my home as well as my vehicle. What I’ve tried to do with my FJ is install some things that aren’t necessarily fool-proof or completely burglar-proof, but that does buy me some time and peace of mind knowing that my valuables are better secured and harder to get to than simply leaving them in my seat. All a thief needs is time and opportunity, the more you can do to increase that time needed and take away the opportunity, the better off you’ll be. Your vehicle, like your home, should appear to be a hard target, which will in turn cause criminals to look elsewhere for a softer target. I wanted to address firearms first and foremost, as many of you probably carry them in your vehicles. Whether this is just temporary when going to and from the range, or stowing a concealed carry sidearm if you’re going into a government building, etc. Securing firearms properly is paramount, I don’t think any of us could live with ourselves if a firearm was stolen as a result of our negligence and used in a crime. That or being accessible to a child. So what can be done? There’s no excuse for not buying the right equipment to secure your firearm, even if it winds up being just as expensive as the firearm itself. This is of course not to say it is, but I know the security box I’m about to talk about was equivalent to the cost of buying another gun and I was glad to make the purchase. A few years back, when I knew I wanted to start modifying my vehicle, one of my first purchases was a Tuffy Security Cargo Drawer. Shipping was a bit pricey, but in all I think I spent around $750. I installed the drawer myself in the span of an evening and it was relatively painless. Something I’d tell anyone if asked about the install, is that during the last step of sliding the drawer in onto the sliders, while following the instructions carefully I might add, the slide rail was bent causing the ball bearings to spill out. After some back and forth with the company they eventually agreed to send me a new slider out and I finished the install. 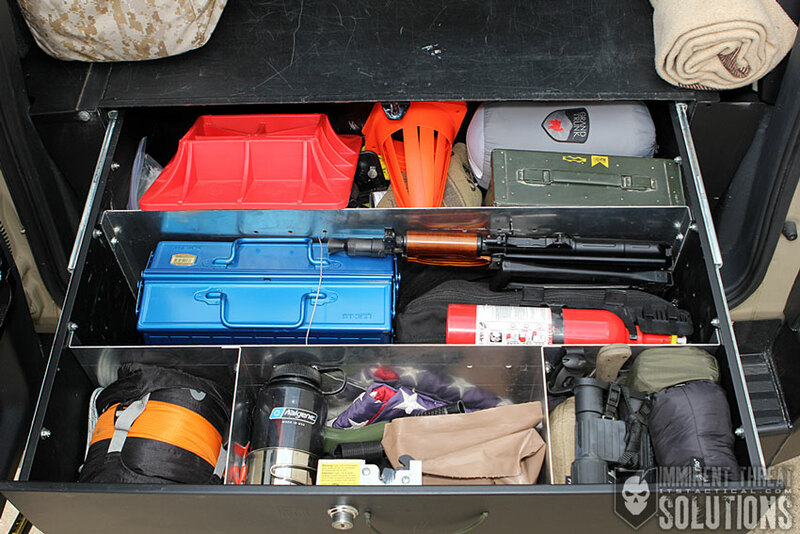 The drawer has operated well since then and I’m continually impressed with what can fit inside. Primarily I keep firearms here when transporting them, but also have recovery equipment, lock picking equipment, camping equipment, food, water and spare clothing. There’s a whole separate article I could write on what I carry in the drawer and perhaps I’ll get into that one of these days. Needless to say, I can get lost in the backcountry and be ok with all the equipment stored in there, even if it took me a few days to find my way back to civilization. A few security features on the Tuffy Security Cargo Drawer really sold me on it. These consist of a pry-guard locking system, anti-twist push button lock system complete with weather seals and a 10 tumbler double-sided security key. 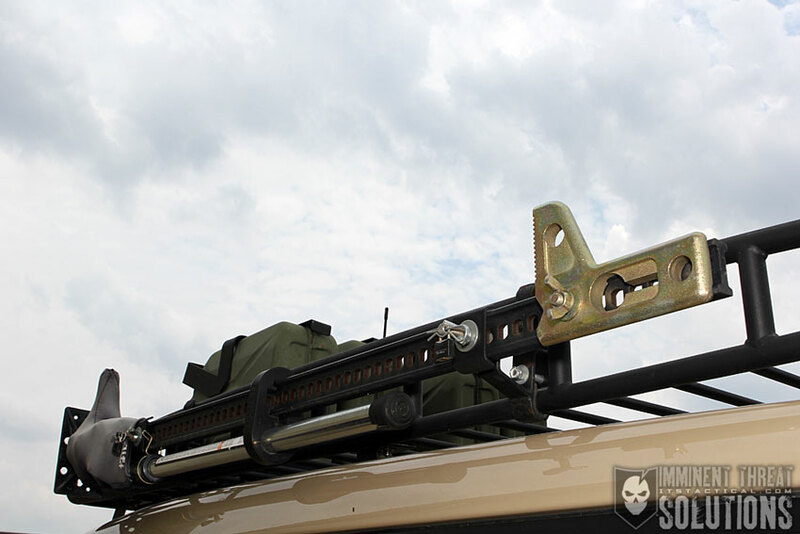 There was also the 16 gauge steel construction, internal divider kit (optional), powder coat finish and having around 12,500 cubic inches of storage space that sealed the deal. I have sacrificed storage space for the drawer, but the organization and lock-ability has more than made up for the space I gave up. Another item I have in the cab of my FJ is a small portable lock box. 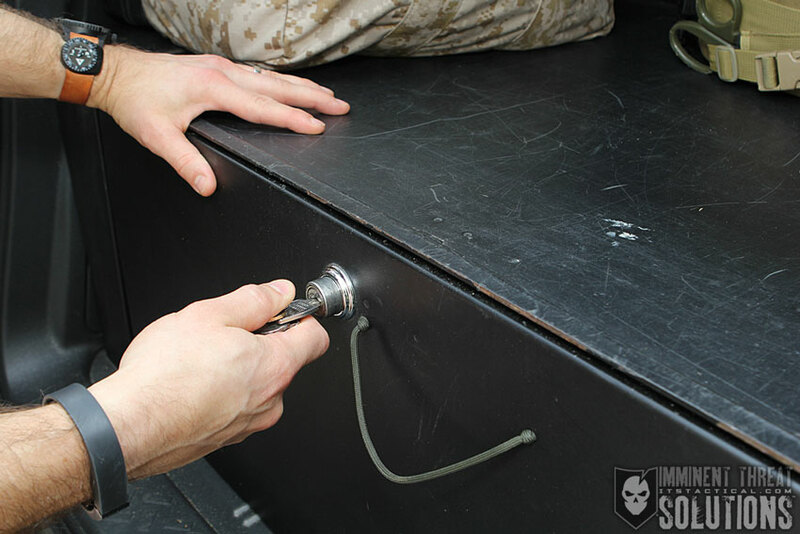 This is a key-based lockbox design that also has a double-bit security key like the Tuffy Security Cargo Drawer. I honestly have no idea where I purchased it from, but I have three others that are all keyed the same around my home and in another vehicle. Here’s a similar box on Amazon. The box features a security cable that runs around the base of my seat and reattaches to itself before getting locked into the box. It can be a pain to manage on occasion, but it does the job. I’ve been wanting to upgrade to a Tuffy Portable Safe, but haven’t been convinced that a combination lock is just as secure as a double-sided key. Don’t get me wrong, even the self-described “security” key on the Tuffy box is pickable, the double-sided keys just increase that critical “buying time” factor I’ve been mentioning. 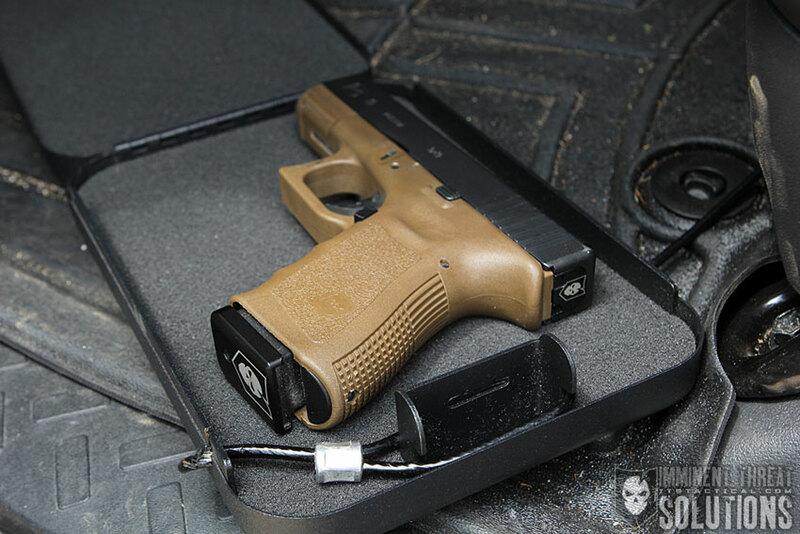 Other than the application of the lock box for its primary purpose of locking up a handgun, it’s also great to utilize when traveling. It can be cabled into a suitcase and used as the required locking case necessary for airline travel. Another element to the security on my FJ is the combination lock security cable routed through my gas tanks, that prevents them from walking away. 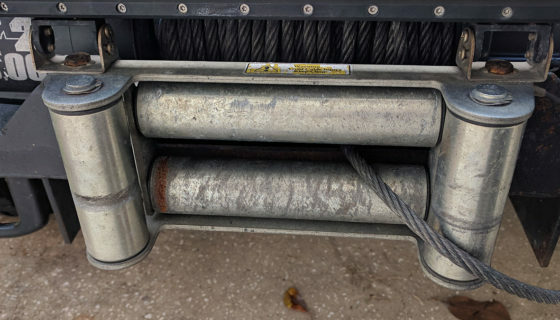 It’s a thick gauge steel cable that would certainly take some time to cut through for the willing thief. I also have small padlocks on the posts of my Hi-Lift Jack mounting brackets and the posts of my shovel/axe combo mounting brackets. 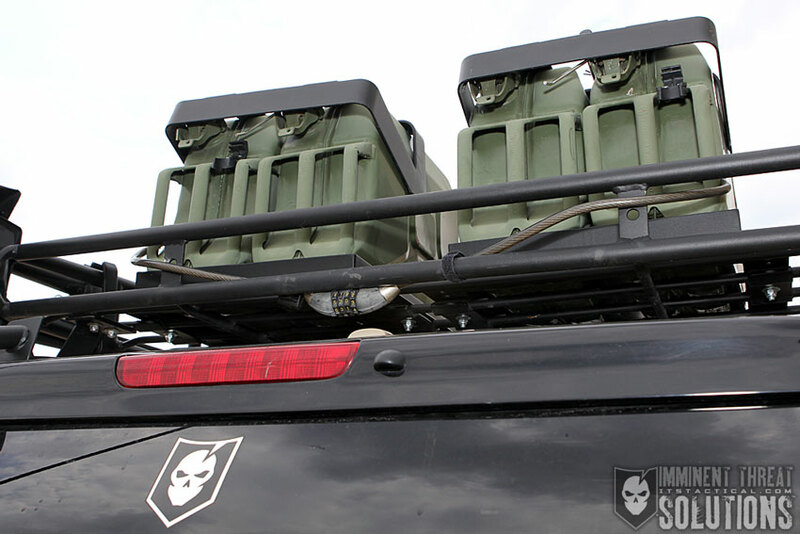 These, along with the gas tank mounts are made by Baja Rack, the manufacturer of my roof rack. I’ll have another article where I talk about the roof rack in detail too. Something that I’ve considered adding to my security is The Club. It wouldn’t be an all the time device, but would go on when I need the extra visible security. Additionally, I utilize what amounts to wheel locks on lugs of my wheels. They’re not wheel locks in the traditional sense, but they do take a special deep socket to turn. It’s deeper than a standard deep socket, which as mentioned, effectively make them like a wheel lock. I always have to provide the special socket to Discount Tire when I’m there getting a tire rotation, etc. Most modern vehicles, my FJ included, have some kind of engine immobilizer system that corresponds to a chip in the key. This electronic security device prevents the vehicle from starting if the correct key isn’t inserted, or if a thief attempts to bypass (hot wire) your ignition. My FJ has a flashing red LED on the stereo that blinks when the immobilizer is activated and is another theft deterrent. An alarm system could be a useful upgrade, but in my opinion they’re overrated. When’s the last time you cared that a car alarm was going off and actually took the time to look into what might be going on, rather than just get annoyed. A small detail, but important one I’d like to add here is window tint. If a would-be criminal can’t see what valuables you might have in your vehicle, they’ll be less likely to break in to find out. I recommend going as dark as the law allows with your tinting an even carrying a dark blanket to cover up anything during a shopping trip, etc. When I was talking to Mike about this article, he said that in D.C. where he used to live, cars were getting broken into that just had the residue from a suction cup mounting bracket on their front windshield. This was a sign that the driver used a GPS and just took it off when they parked. Thieves were breaking in and finding them in glove boxes. Just a tip if that sounds like something you’re doing. Now that I’ve gone over my security precautions, I’d like to wrap this article up with a list of not only what I went over, but of some additional tips to keep in mind that don’t necessarily pertain to a vehicle set up for overlanding. Park in well-lit areas, roll up your windows and lock your doors. Don’t leave valuables, shopping bags, backpacks, purses, etc. in plain sight. Having these visible through your windows is just asking for a smash and grab. 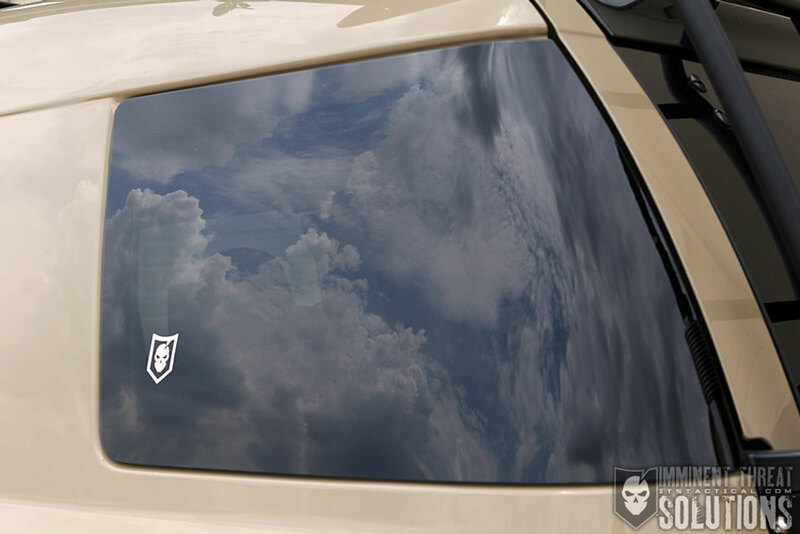 Invest in dark window tinting, but be sure to check your local laws on the legal percentage. Out of sight, out of mind. At the minimum, carry a blanket in your vehicle for covering up shopping bags and valuables. Don’t leave mail with your address on it in your vehicle. Take the original vehicle registration form out of your vehicle, if you legally have to keep it in the vehicle, black out your address. Use The Club to lock your steering wheel and add another layer of security if your vehicle doesn’t have an engine immobilizer feature. If you’ve upgraded your wheels, purchase wheel locks. Don’t use magnetic key hiders, they can be found, especially if you’re spotted using it. Cable lock anything on the exterior of your vehicle that can be easily removed. 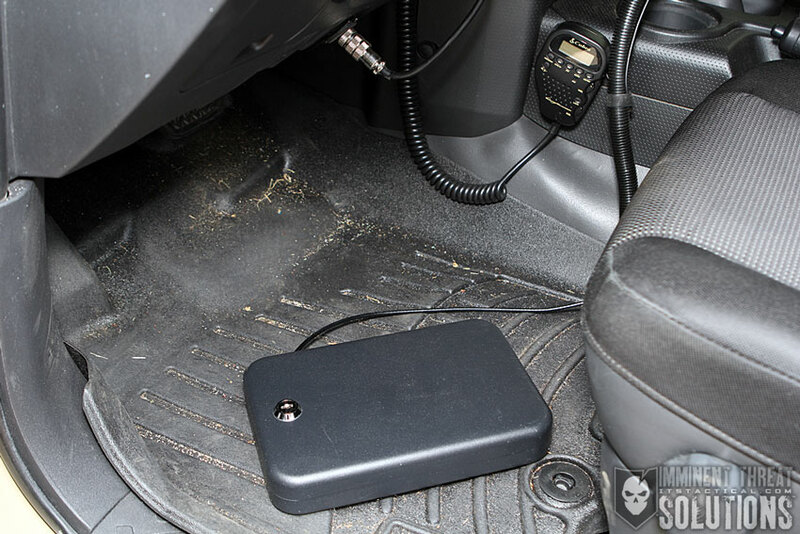 Invest in a lock box that can be cabled in underneath your seat, or a larger drawer system that can be bolted down in the trunk. 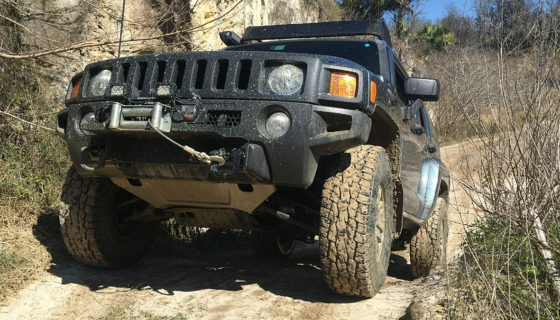 These are made for many different vehicles, so do some digging. Research options like iTunes in the Cloud, Spotify or Pandora for Music to take your music with you. Or have a portable method for storing your music so you’re not leaving it in your vehicle. Remove your garage door opener from your vehicle if you don’t park in the garage. Don’t have personal information on your keys, if they’re lost or stolen, someone now has your name to look up where you live and probably now has a key to the front door. Invest in a car alarm if this seems logical in your area of town, engine immobilizers are common now in newer vehicles and you might already have one installed. Tactically park, we have a whole article about the subject and why you should back into parking spaces. 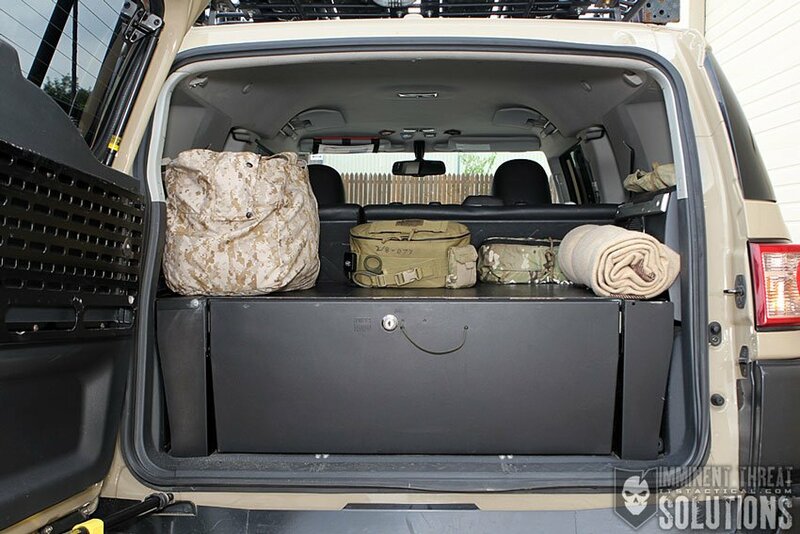 If you’re interested in ballistic protection in your vehicle, Eric wrote an article a few years back on how to re-use old body armor panels.